A wreath is an arrangement of flowers, leaves, fruits, twigs, or other various materials assembled to resemble a ring and used for decoration, especially during the Christmas holiday season. Wreaths are typically used as household ornaments, mainly as Christmas and holiday decorations in the United States and other English-speaking countries. 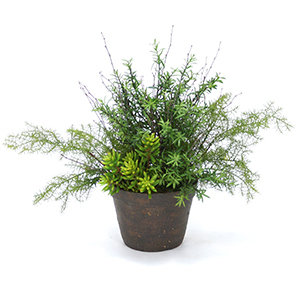 They are usually made from evergreens and symbolize strength, as evergreens last even throughout the harshest winters. Our team of designers have created a wonderful collection of luxury artificial Christmas and holiday wreaths. Each wreath is handcrafted by our team of experienced artisans in our U.S. facility. All Distinctive Designs wreaths are delivered fully-arranged and are ready for display right out of the carton, with minimal or no arranging or “fluffing” required. 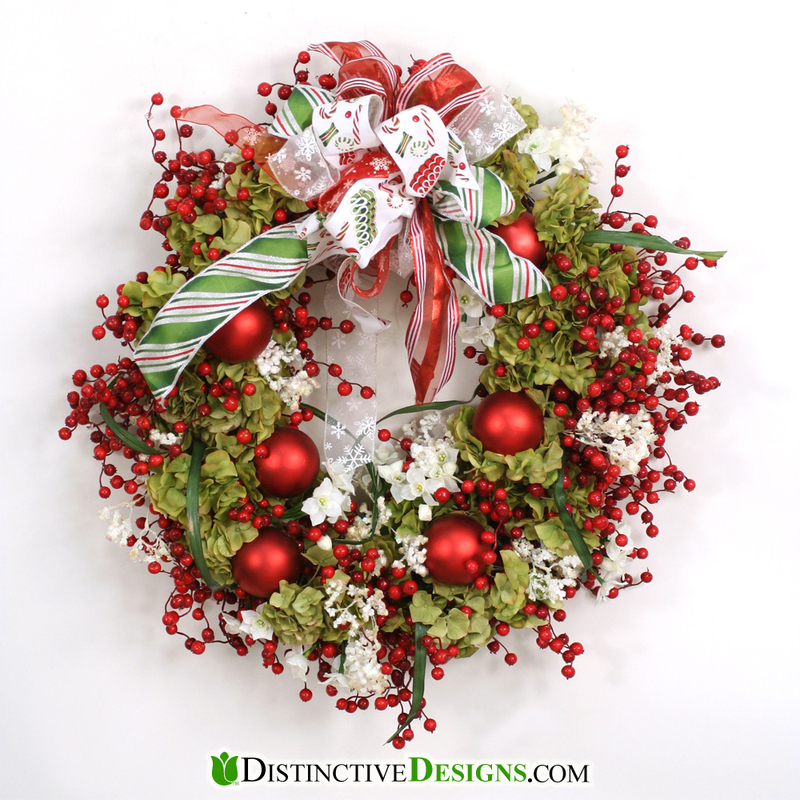 Shop our collection of elegant artificial Christmas wreaths! For more Christmas and holiday decorations shop Seasonal and Holiday. Each year during the first weekend of November the businesses within our entire town participates in the annual Christmas Open House. 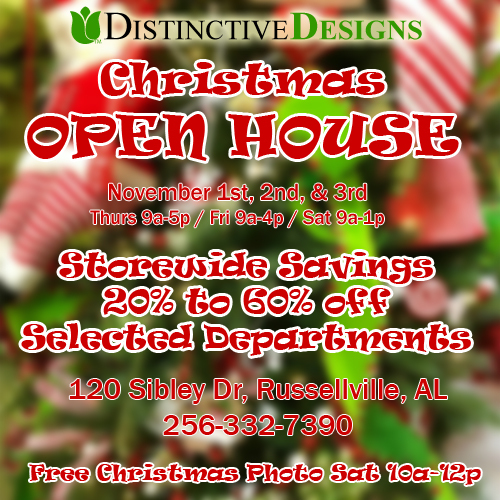 We invite you to come join us for our Christmas Open House, November 1-3, and enjoy storewide savings of 20% to 60% off retail prices in selected departments. Free photos in front of one our beautiful Christmas trees on Saturday, 10a-12p. We’re located at 120 Sibley Drive, Russellville, AL 35654. 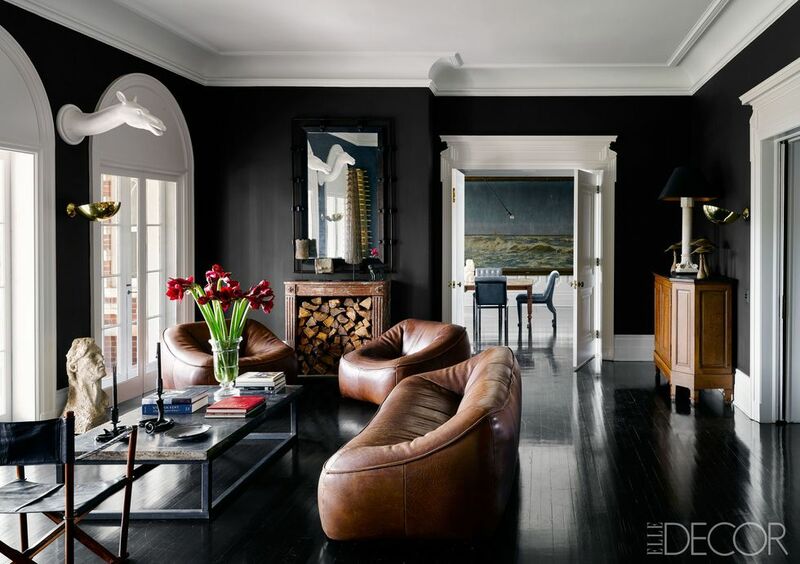 Almost no interior design palette is more striking, more sophisticated, more refined than black and white. 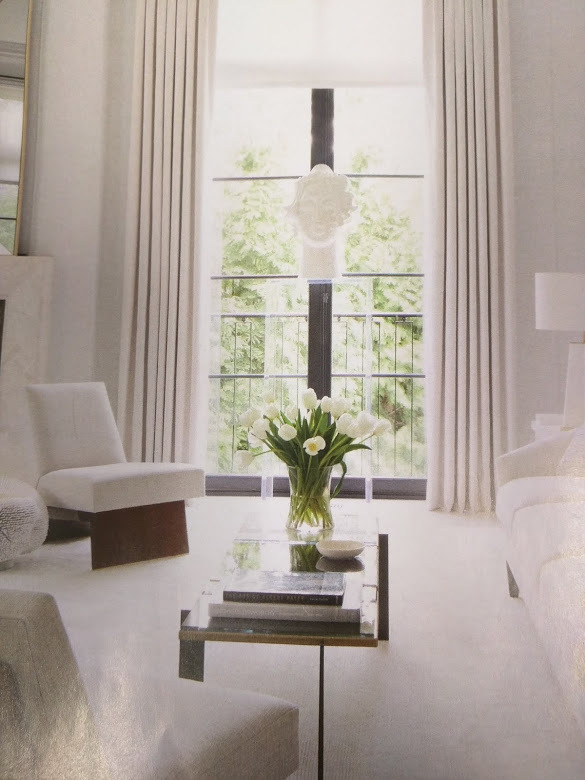 These strong neutrals are stark yet chic and create a clean backdrop for many textures, colors, and décor styles. Recreate stunning Black and White looks or enhance your own design. Check out our florals that echo that black and white theme, or let the panache of that stark background accentuate more colorful floral décor. 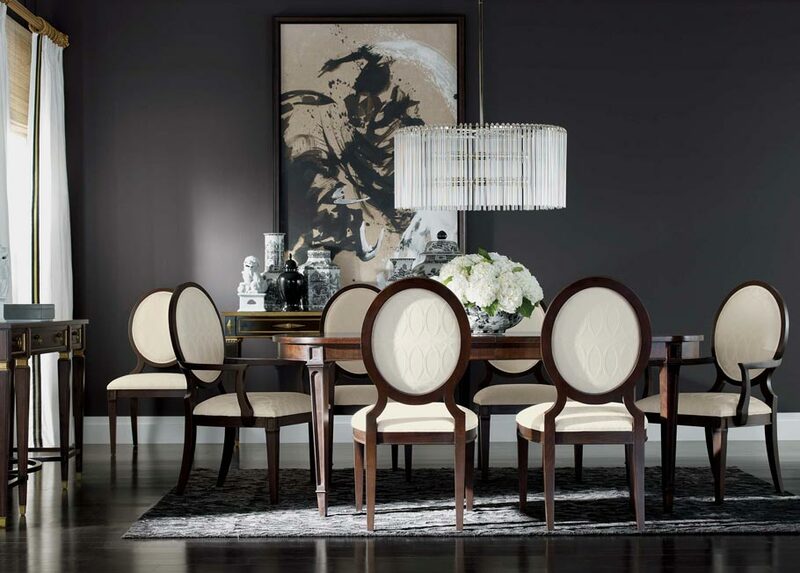 Shop the Black and White trend now at DistinctiveDesigns.com. Be sure to sign up for our newsletter and receive special insider tips, trends, and special offers. It’s quick, easy, and free! Design trends come and go quickly. We’re here to help by giving you special insider information on current and upcoming design trends. Our founder, CEO, and Chief Designer, Emma Hoffmann, has hand-selected a collection of beautiful and elegant items to help you stay ahead of design trends. Add a touch of sophistication to a home or office with black and white florals. Black & White. Add a touch of sophistication to a home or office with black and white florals. 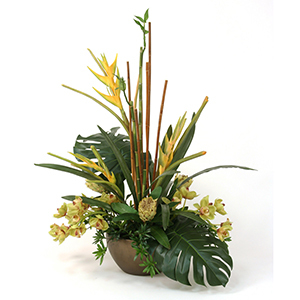 Tropicals florals pair well with contemporary and mid-century furnishings. Tropicals. 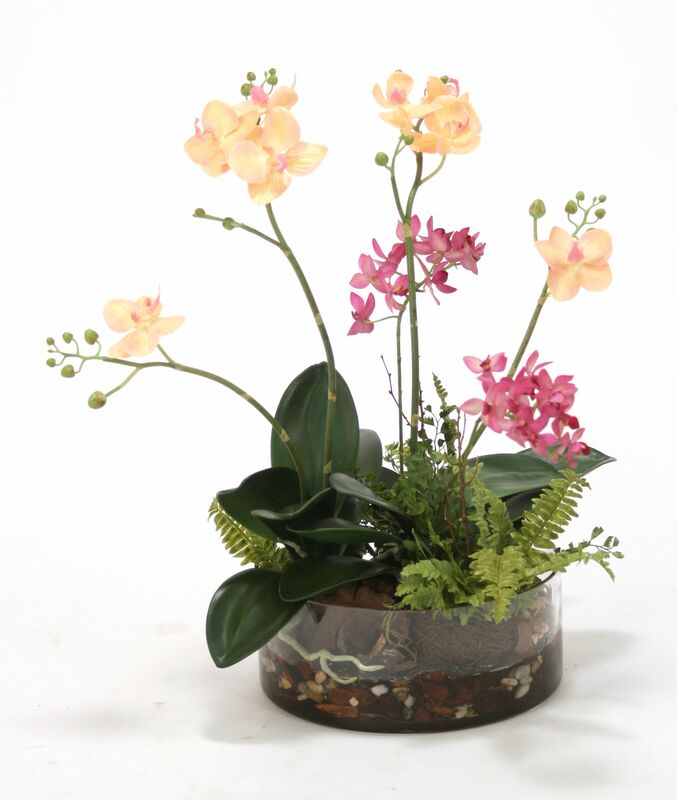 Tropicals florals pair well with contemporary and mid-century furnishings. 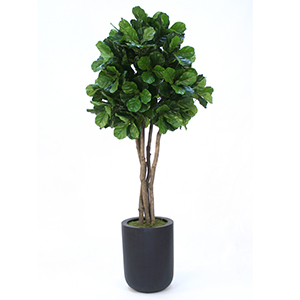 Trees in new contemporary containers work great with eclectic furnishings from sophisticated to farmhouse casual. Trees. Trees in new contemporary containers work great with eclectic furnishings from sophisticated to farmhouse casual. Blue and white arrangements blend well with casual blue interiors from cool beach tones to traditional interiors. Blue & White. Blue & white arrangements blend well with casual blue interiors from cool beach tones to traditional interiors. Add natural ambiance with succulents, herbs, grasses, and moss in versatile containers that complement any decor. Succulents & Grasses. Add natural ambiance with succulents, herbs, grasses, and moss in versatile containers that complement any decor. Summer florals come in a wide variety of pastel to bright florals to choose from to complete your room. Summer. Summer florals come in a wide variety of pastel to bright florals to choose from to complete your room. We love what we do and we’ve been bringing style to life since 1976. Check out the trends below and visit us online at DistinctiveDesigns.com. Get the latest design trends, news, and specials by signing up for our newsletter. Fiberstone is a mixture of fiberglass and crushed stone. Fiberstone is a versatile material. It can have a rough and sandy texture which makes it look and feel like real stone or finished concrete. It can also have a smooth to lightly textured finish. These materials create a durable material that is suitable for both indoor and outdoor use at any temperature. It can be colored, natural, or have a weathered aged look. The combination of these materials used to make fiberstone produce the appearance of natural stone but is lightweight and more versatile than natural stone. Additionally, fiberstone is easier to move than identical concrete and natural stone products. The reinforced fiberglass backing of fiberstone makes it less fragile than concrete. Ficonstone is similar to fiberstone. Ficonstone is a combination of fiberglass, cement, sand, and finely ground stone. Ficonstone has a natural, rough heavy feeling. Check out these designer fiberstone planters and containers. How to decorate inexpensively with artificial flowers and fruits & vegetables? 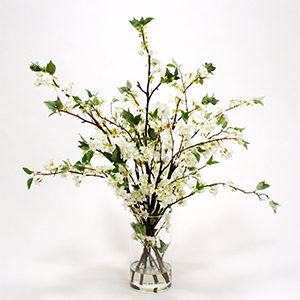 Decorating is simple and inexpensive when using artificial flowers and fruits & vegetables. 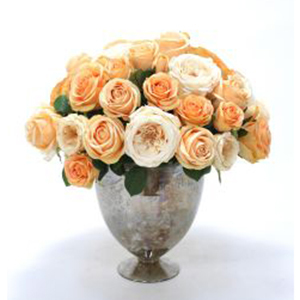 Silk flowers casually dropped in vases appear natural and fresh-cut, just like fresh flowers. Artificial flower “drop-ins” are the easiest, least costly way to fill every room with colorful flowers that do not wither or wilt. No floral design expertise is required. Similarly, create tabletop décor right out of a fashion magazine with artificial fruits or vegetables simply mounded in bowls or compotes. Your bowls or ours. No muss, no fuss! At Distinctive Designs, we make decorating easy. 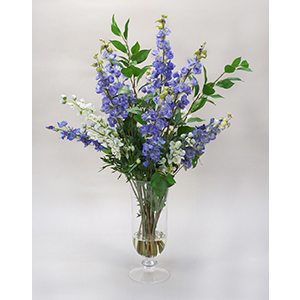 Start by selecting your favorite designer artificial flowers and casually drop it your favorite container. Waterlook® is our exclusive trademarked process for achieving the illusion of fresh-cut flowers in water. 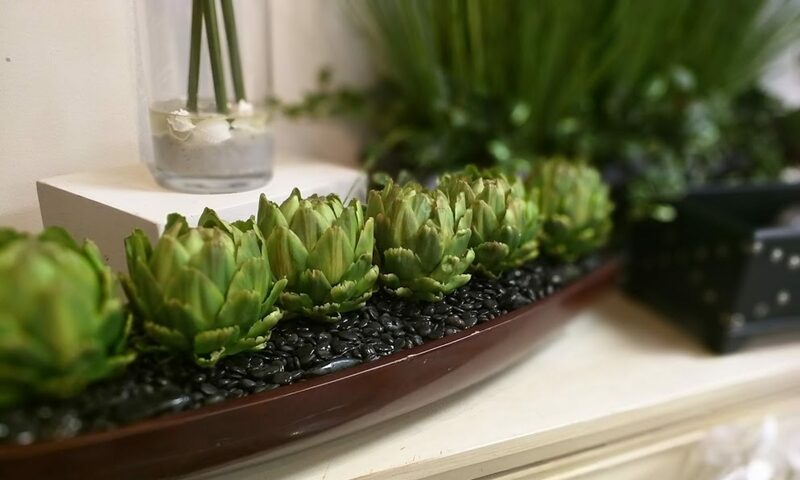 Each Waterlook® arrangement is handcrafted by our team of artisans in our in-house studio. Waterlook® stays clear and resists discoloring indefinitely. It has the same refraction as clear standing water, so submerged stems exhibit the same slight magnification as real water. The process of making Waterlook® is an art form in and of itself. It takes several days to create and hand pour Waterlook®. Each artisan has years of experience. Each pour and step of the process is meticulously inspected to meet our high-quality standards. Only the best will be accepted and become an official Waterlook® product. Waterlook® cures to a solid, smooth, and non-sticky finish so dust does not adhere to its surface. Cleaning Waterlook® is easy. Simply use a duster, wet wipe, or hair dryer on cool setting. 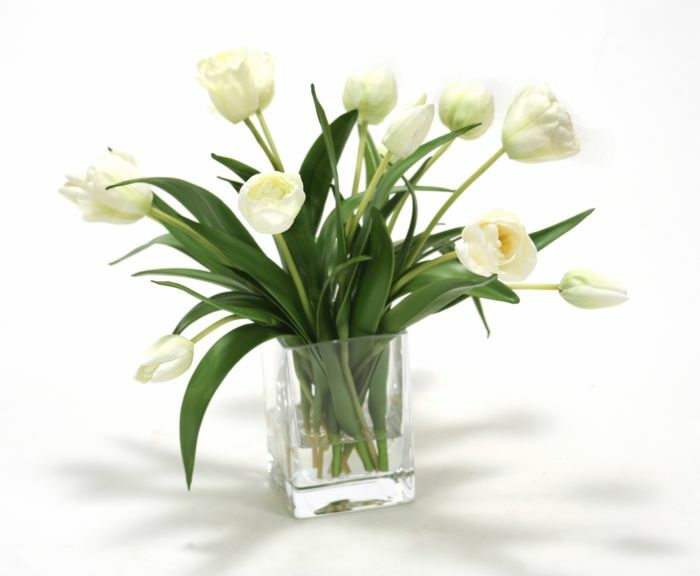 Treat Waterlook® florals the same as you would fresh flower arrangements. Avoid exposure to direct sunlight or extremes of heat or cold. Exposure to intense UV rays can cause eventual discoloration of any clear polymer. Waterlook® is a registered trademark of Distinctive Designs International, Inc. 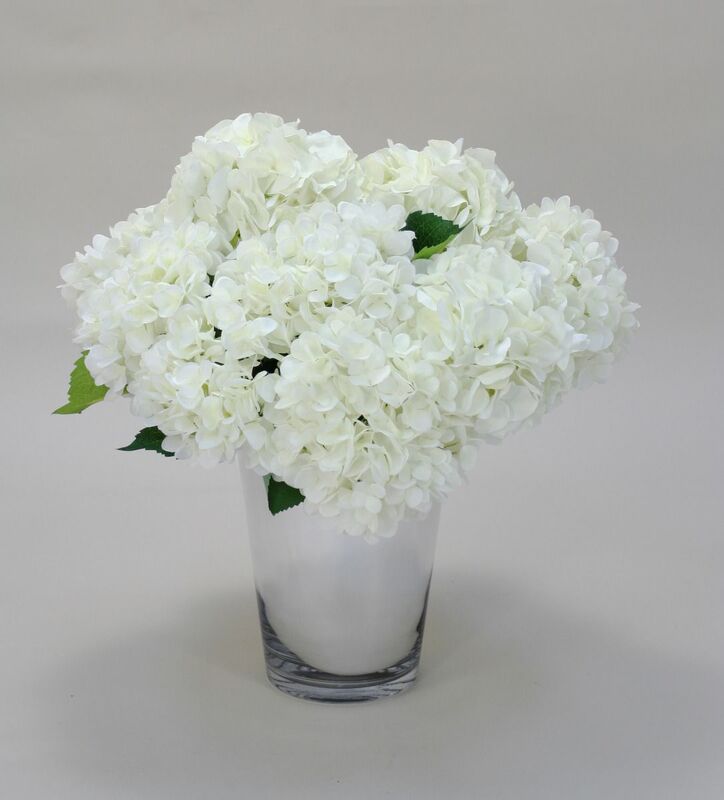 The phrase “The illusion of fresh-cut flowers in water” is a trademark of Distincetive Designs International, Inc.
Official Waterlook® products are available on our website to approved wholesale accounts and from select retailers. View our entire line of Waterlook® flower arrangements at https://www.distinctivedesigns.com/waterlook.html. Welcome to the new Distinctive Designs blog! We’re excited to announce the launch of our new blog and hope you’ll find it useful, educational, and entertaining. Since 1976, Distinctive Designs International, Inc (DDI) products have beautified commercial and residential spaces around the world. As a pioneer in the designer artificial floral industry, we’ve amassed a wealth of knowledge and creative understanding. Our new blog gives us the opportunity to share that knowledge and creativity as well as news, updates, and an occasional inside look to the DDI family. If you’re wondering what else you can expect from the content you will find on our blog, then bookmark this site now and check back often for updates. You can also follow us on social media at Facebook, Instagram, and Twitter. We look forward to growing with you as we embark on this new journey. Thanks for stopping by! 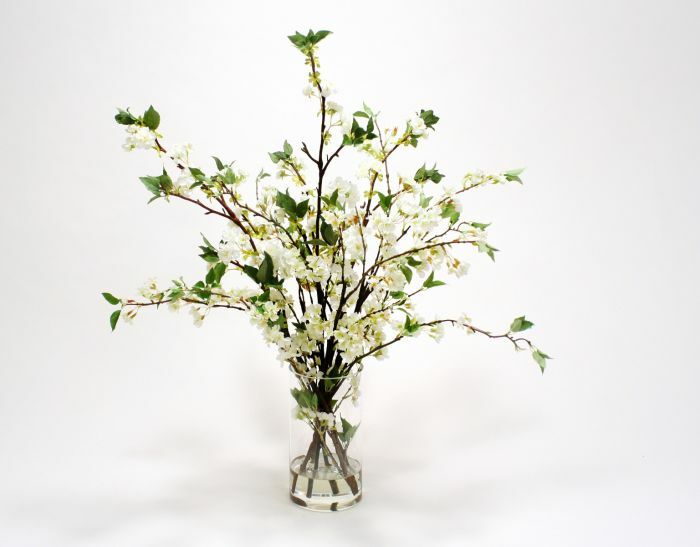 Distinctive Designs International, Inc (DDI) is an award-winning manufacturer of designer handcrafted artificial flower arrangements, plants, trees, and coordinated accessories. We love what we do and we’ve been bringing style to life since 1976. Read our story. You’re invited to submit high-quality photographs of your interior design projects whenever Distinctive Designs florals, plants, or trees are featured prominently. We’ll provide attribution if we use your photos on our website, in social media, or in other DDI branded media, and we will award you with a special coupon to use on your next DDI order. Learn more. Copyright © Distinctive Designs International, Inc. All Rights Reserved.